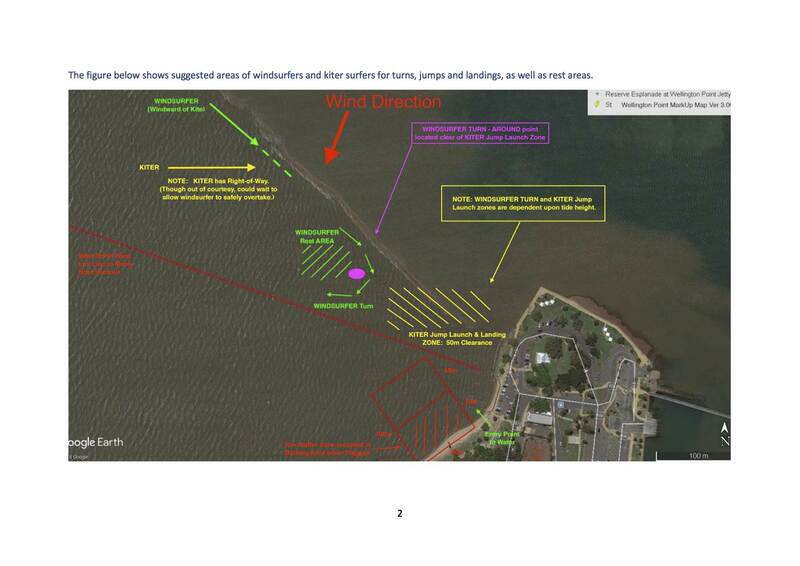 Redlands City Council is undertaking a process to designate a portion of the western beach of Wellington Point Reserve as a Bathing Area, marked by bathing flags, southeast of the region of the sandbar to King Island (see diagram), in close proximity to an extremely popular wind and kite surfing destination. Although 100meters is indicative only in the attached diagram, the final size and location of the Bathing Area is to be decided later in 2019 by public consultation. This clearly will impact Windsurfers and Kiters and other watercraft users at this location. In anticipation of the potential for increased risk, injuries from collisions and other potential mishaps to all Users of this location, representatives from the Kiter and Windsurfer communities have met to develop a set of guidelines to help educate our groups and promote safety in this location, in an effort to work with Council to help keep Wellington Point a safe place for all users of this unique area. The diagram showing suggested activity zones and our proposed guidelines are appended. This week on NNe was very difficult to do a run along the bank 2 days in row. With approx 8 kites it was rare to ever get a clear run along the bank. Even with these great guildlines it will still be difficult as the kites what to jump in the same area close to the bank where the speed run is. It is a good idea to have a rest area for windsurfers after speed run. This area needs to be as small possible to reduce impact on kites jumping and windsurfers finishing speed run and turning. One issue that I have noticed is when people are taking videos of jumps this encourages kites to stay close to bank and not focus on others in the local area. There has been many dogs off lead swiming in the speed run which should not be allowed. In wind above 15 knots learning to windsurf or Kite should be discouraged from this area when speeds in excess of 30 knots are done as the windsurfer only has one option which is bail out when committed to speed run. 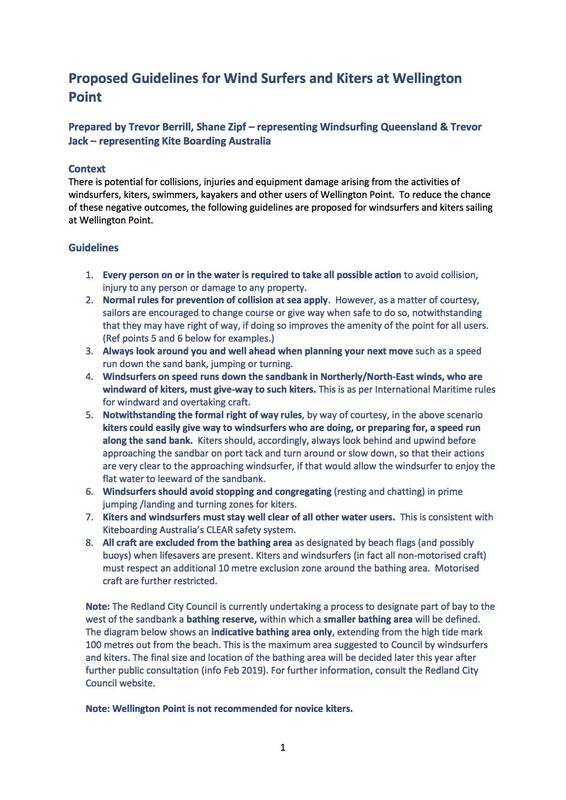 If possible could you also have some guildlines for a Easterly as in these directions there are potential for head on collision as windsurfers hug the bank both directions. Looks good as long as kiters don't jump in other areas as I am always worried of going downwind of a kiter (to give way) in case they jump and land on me. I got hit in the head the other week by a kite boarder who did not obey rule 1. He came from behind so could not see him coming. Then he abused me for getting in his way! He clearly had no understanding of these rules. Spot on! Yes, normal sailing give way rules apply as per KA in: www.kiteboardingaus.com.au/safety .. though not every case is as clear-cut as one no doubt has observed on the water for the Wellington Point to King Island sandbank speed runs. Consider the following. Right hand to windward rider (Starboard Rule) has right of way. But for the rider approaching on the Port tack (left hand to windward), this rule will present a 'conflict' if that Port rider is a Windsurfer close to the King Island sandbank and the Starboard rider is a Kiter, also travelling 'at speed' and close to the sandbank. The preference for the Windsurfer would be to NOT pass under the Kiter (viz. because of the Kite lines), instead, pass windward of the Kiter, (to avoid the Kite lines, though contrary to the rule), only to then be left with the potentially dangerous situation of insufficient water depth up against the sandbank in which to safely complete a windward pass of the approaching starboard Kiter. The risk being: Windsurfer travelling 'at speed' and the fin colliding with the sea bottom, potentially causing significant damage to both equipment and rider. To help mitigate confusion and potentially avoid injury, it would benefit both Kiters and Windsurfers to further discuss and clarify how each group of riders: should or would or how they would like to respond in this space when they are presented with this rider front-on scenario. TB and I got together Tuesday afternoon and drew up two new cases for consideration. The first case: when a moderate to strong EAST wind blows over the Wellington Point to King Island sandbank, and the second case: when a moderate to strong SOUTH WEST wind blows over the bank.Our mud-maps are just simply drawn on a white board, and a photo of each hopefully will upload here. Each map attempts to capture the tracks and interactions of both Kiters and Windsurfers as they would 'typically' travel along the sandbank, but these tracks are by no means set in stone. 2. Because of the wind shadow behind King Island created by the Easterly, some Windsurfers may choose to turn before, or further afield of the King Island shadow. But regardless of where they turn, their track requires 'a crossover' of the path of oncoming Windsurfers. Normal sailing rules would apply in this 'crossover' zone. 3. 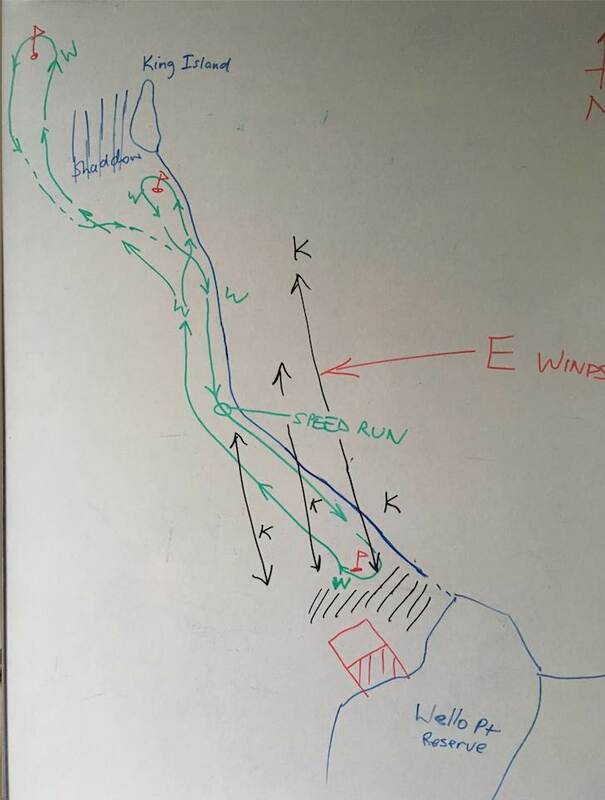 The Kite launch, jump and land zone would typically be 'squeezed' into the zone just north of the Bathing Area, and just below the place where Windsurfers would conduct their turns. However, the Kiters are NOT restricted to travel close to the sandbank, and as their tracks in the map show (black lines), may even choose to travel on the eastern side of the sandbank up to or on full tides. The point to note is this zone becomes an extremely congested area for both Kite and Windsurfer activity. 3. If one chooses to sail close to the sand bank at the bottom end of the speed run, into and amongst kites, beware of the risks of hitting kite control lines, Kiters and other Windsurfers. 2. Windsurfers are restricted by their fin depth and therefore must travel in tracks further away from the sandbank in this instance because of the shallow gradient of the sea bottom on this side of the sandbank. Unfortunately, this places the Windsurfers downwind of the Kites and therefore they must invoke strategies to remain clear of Kites and Kite lines, despite having right of way on a Starboard track towards the Wellington Point Reserve. 3. Because of the wind shadow behind King Island created by the South Wester, some Windsurfers may choose to turn before they reach the King Island shadow, while others may travel further downwind. 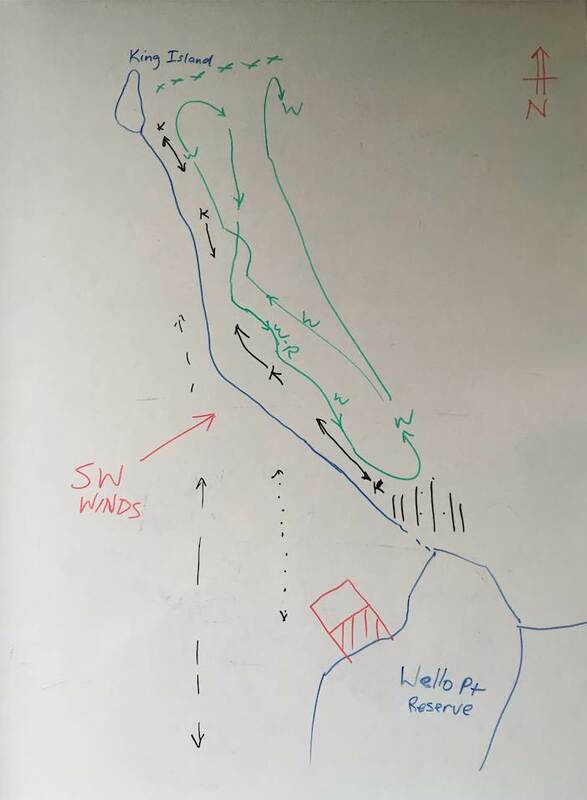 Regardless of where the Windsurfer turns, their track again requires a 'crossover' of the path of oncoming Windsurfers (and potentially some Kiters performing manoeuvres). Normal sailing rules would apply in this 'crossover' zone. 4. The zone around the tip of Wellington Point Reserve once again becomes an extremely congested area for both Kite and Windsurfer activity. 4. Windsurfers could alter their course to sail well clear of Kiters, allowing Kiters the enjoyment of the speed runs on shallow water up and down the sandbank.